This custom backlit onyx bar for the Costantino’s Venda Bar & Ristorante, crafted by the GPI Design team, draws in visitors from the bustling sidewalk. The family-owned establishment has several properties throughout this plaza, with the backlit onyx bar marking the important entry corner. The hand-selected stone was sourced by the GPI Design team with ownership involvement, settling on a glowing honey onyx with sweeping highlights of rust and purple. 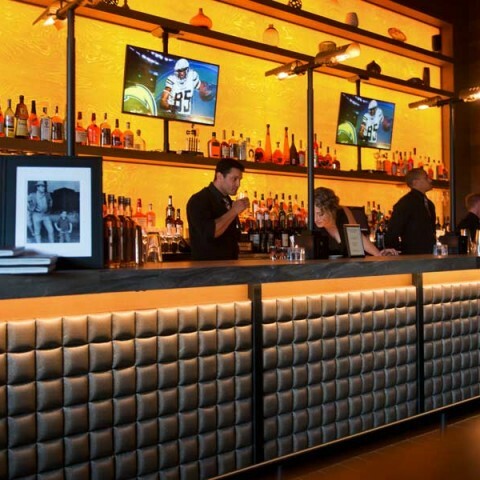 Integrating into the millwork details, the backlit bar has a custom dimming system that allows workers to change the lighting levels according to ambient light or the occupancy of the space.